David Raitt was born on 1 October 1869 in Arbroath, the eldest son of David Dorward Raitt and Mary Purvis, and he died at 12 Victoria Park Street, Glasgow on 27 July 1934. The death was registered by son Archie. He married Annie Edward Duncan on 21 July 1893 in Arbroath. He was a journeyman house painter at the time, while she was her widowed father’s housekeeper. David’s father was listed as a merchant seaman (Captain), deceased, and witnesses were James Hutton and Maggie Duncan. 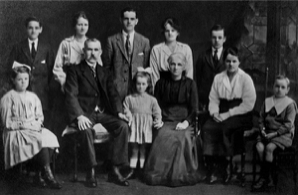 The couple had nine children between 1894-1913: Mary Purvis (born 22 May 1894 in St Vigeans and died in 1975 in Glasgow); Annie Duncan (born 23 January 1896 in St Vigeans and died in 1979 in Glasgow); David Dorward (born 19 October 1897 in Arbroath and died presumably in Southern Africa); Lily (born 14 March 1899 in Arbroath and died 25 December 1994 in Glasgow); Edward Duncan (born 3 August 1901 in Arbroath and died in November 1964 in Fort Lauderdale, Florida); James Hutton (born 18 October 1903 in Dennistoun, Glasgow and died 15 January 1963 in Partick, Glasgow); Margaretta Isabella (born 31 January 1906 in Dennistoun and died in 1996 in Glasgow); Archibald (born 8 September 1911 in Garngadhill, Glasgow) and died in 1986 in Glasgow; and Catherine Allan (born 2 November 1913 in Glasgow and died in 1985 in Arbroath). Annie Edward Duncan was born on 6 December 1869 in Arbroath and died in Glasgow on 21 March 1952. She was the daughter of James Duncan, born about 1843 in Lunan, Angus and Isabella Edwards, born 9 October 1844 in Beholm, Kincardineshire and dying in Arbroath on 16 March 1884. In the 1871 census for 21 Dishland St, St Vigeans is Mary Raitt, head, seaman's wife, aged 25 and son David, aged 1, living in one room with one or more windows. In the 1881 census for St Vigeans, living at 41 Helen St, is Mary Raitt, wife, head, age 35, sailor's wife, born Arbroath; and sons David, 11, scholar, born Arbroath; John P., 6, scholar, born Arbroath; and William, 9, scholar, born Arbroath. In the 1891 census, David Raitt, aged 21, is an apprentice painter living at home at 15 St Vigeans Rd, St Vigeans and occupying four rooms with one or more windows with his widowed mother Mary Raitt, aged 45, and her sister, Elizabeth Purvis, aged 55; and his brother John, aged 16, heckle machine worker. Brother William was in Glasgow. In the 1901 census for Millgate, Ladyloan, Arbroath living at 31 Hannah St in two rooms with one or more windows is David Raitt, head, 31, house painter. born Arbroath; with wife Annie (31), daughters Mary (6, scholar), Annie (5, scholar), son David (3) and daughter Lily (2). In the same house or buildings is James Hutton and family. I am not sure yet who the Huttons were, but James was a witness at David and Annie’s wedding and their son born in 1903 was named James Hutton Raitt - so presumably there was some close links between the families. Living almost next door at 27 Hannah St, is David Doig and family - David being the eldest son of William Robertson Doig and Elizabeth Dorward Raitt - these parents are actually living at 22 Hannah St. In the 1911 census for 16 Rhymer St, Garngadhill, Townhead is David Raitt, 41, born Arbroath, house painter; wife Annie, 41, born Arbroath (married 17 years with 7 children all living); children Mary, 16, born Arbroath, shorthand typist at a lawyer; Annie, 15, born Arbroath, dressmaker; David, 13, born Arbroath, school; Lily, 12, born Arbroath, school; Edward D., 8, born Arbroath, school; James H., 7, born Glasgow, school; and Margaretta, 5, born Glasgow. They are occupying three rooms with one or more windows. The 1913-14 Valuation Roll for Municipal Ward 6, Glasgow has David Raitt, painter, living as a tenant at 16 Rhymer Street with others. The name given is actually Daniel, but this is clearly incorrect. The property is owned by Frank Burnet, Earlston, Kilmalcolm per David Graham, 180 Hope St, Glasgow. The feu-duty or ground annual is £20 and the annual rent or value is £13 5s. The 1915 Valuation Roll reveals David and family have moved. David Raitt, painter, is now living as a tenant in a house with other families at 6 Chatham Place, Municipal Ward 8, Glasgow. The property was owned by The Scottish Amicable Life Assurance Society Ltd (Bondholders in possession) per James McMichael & Son, 1 Argyll Arcade, Glasgow. The annual feu-duty or ground annual was £22 and the annual rent or value was also £22. In the Valuation Roll for 1920-21 for the City and Royal Burgh of Glasgow, David Raitt, was living with his family at 6 Chatham Place in Municipal Ward 11. His occupation is given as painter and he is one of several tenants, and paying the second highest annual rent or value of £28 5s. The house was owned by The Scottish Amicable Life Assurance Society (Bondholders in possession). Of David and Annie Raitt’s other children not a great deal is currently known at present, though I am trying to track them down. Daughter Annie became a dressmaker and returned to the family home at 12 Victoria Park Street when her husband, Jim Todd, died. He was born in Glasgow in 1892 and they married in Milton, Glasgow on 28 December 1929. His residence upon marriage was Manchester, England and he was an electrical engineer. It is not known when and where he died or whether they had children. Daughter Lilly also returned home when her husband, John Scott, died. Lily married John fairly late in life - on 22 April 1946 in Glasgow and they lived at 22 Market Street, Montrose where John worked in Paton’s Mill. For a while they ran a grocer/sweetie shop down near the harbour. Son James Hutton (Jim) married Robina (Ruby) Jemima Thomson Hughes on 19 June 1937 in Gorbals, Glasgow but they had no family. Robina was born on 19 April 1907 in St Ninians, Stirling and died on 1 June 1956 in Provan, Glasgow. At marriage James was an engineers' storekeeper and Robina worked as a tea room waitress. Daughter Margaretta (Etta) never married and worked in a chocolate factory. Son Archibald (Archie) married Janet (Jean) McVicar Wallace on 4 November 1938 in Provan, Glasgow. She was born on 1 March 1911 in St Rollox, Glasgow and died there in Park Circus in 1972. At marriage Archie was a confectioner's cashier and Janet was a clerk. The couple had two children: David Wallace, born 29 November 1940 and dying just a few days later on 11 December; and Hilary Margaret (birth record not yet found). Hilary married Michael Montgomery in 1975 in Glasgow and had two boys: David and Michael. There is an interesting tie up here with the Aberdeenshire Raitts! Janet McVicar Wallace's parents were Isabella Taylor Raitt (born 27 September 1876 in St Nicholas, Aberdeen and died 11 October 1944 in Glasgow) and Richard Wallace (born 26 June 1876 in Linlithgowshire). The couple had four children including Janet. Isabella's parents were John Raitt (1838-1908) and Ann Simpson (1840-1913). John Raitt, was one of the many Raitts in Aberdeenshire, whose ancestry goes back a very long way and which is traced on a separate page which also provides more details of Janet and her family. Daughter Catherine Allan, the youngest child of David and Annie, worked as a shorthand typist and was employed for a time at John Brown’s Shipyard on the River Clyde. She married Archibald Millar, a Cashier with the Nth Insurance Co., on 15 September 1944 in Hillhead, Glasgow and some years later they moved to the Hyndland area of Glasgow. Archibald was born on 12 August 1911 in Anderston, Glasgow and died in Arbroath in 1982. When Archibald took early retirement after the Commercial Union took over the Nth Insurance Co., the couple moved to Arbroath at the end of 1968. There, Archibald was an elder in St Margaret’s Church and was for some time Secretary of The Arbroath Music Festival. They had one daughter, Linda, born on 3 February 1947 in Glasgow, who became a Registered General Nurse in Glasgow Royal Infirmary. She moved, with her parents, to Arbroath and there met her husband Malcolm Connor, a banker with Bank of Scotland. He was born on 17 May 1941 in Edinburgh. They moved about a bit - Cupar, Fife, Kirkcaldy, Fife, Crieff Perthshire and then Dalgety Bay, in Fife. Their three children were born in St Andrews, Fife: Jillian on 17 April 1971; Jacqueline on 3 June 1972; and Martin on 28 November 1974. Jillian married John Howatt in Inverkeithing, Fife in 1997 and has two boys; while Jacquline married Craig Donoghue in Aberdeen in 2001 and has one son. Linda became one of the first Practice Nurses in the country working at Inverkeithing Medical Centre from 1981–2001, when she moved with her family to “Whinloans” Kilry, a very small hamlet situated at base of Glen Isla in Angus. 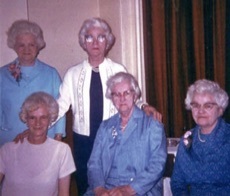 The photographs below show the family of David Raitt and his five daughters. His descendants are given after them - the complete family (i.e. 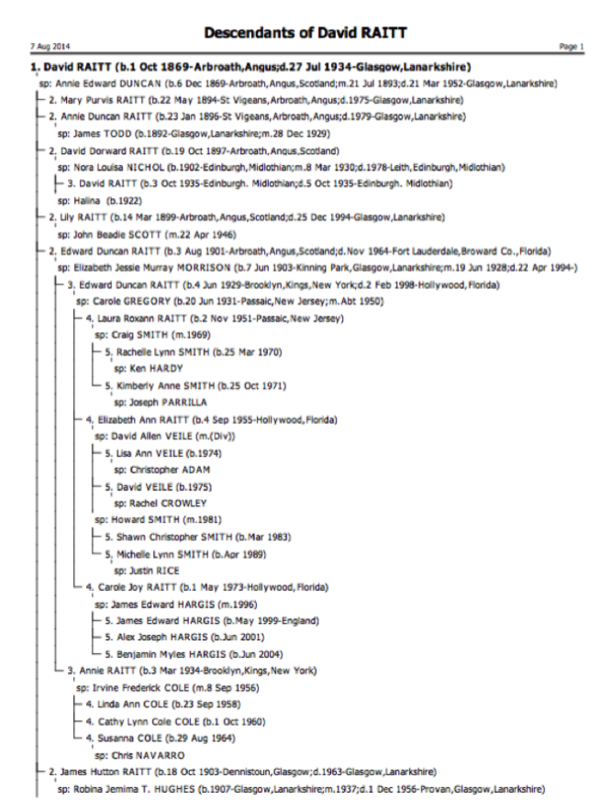 his brothers) are included in the tree showing the descendants of their father David Dorward Raitt (though this needs updating). Like his elder brother and sister, Edward Duncan Raitt also left Glasgow to live abroad. Aged 21 he arrived in Boston, Massachusetts on 1 Oct 1923 aboard the Tuscania. His occupation was instrument maker (not the musical kind). His father was given as David Raitt, 6 Chatham Place, Glasgow and his final destination was given as Passaic, NJ. He was accompanied by a friend David Napier. He returned to Glasgow in 1926, arriving on 1 August aboard the Transylvania of the Anchor Line. He was 24, an instrument maker, was going to 6 Chatham Place, Glasgow, his last permanent residence was the USA as was his future residence. He arrived back in New York from Glasgow on 12 Oct 1926 again aboard the Transylvania. Last permanent address was Clifton (near Passaic, New Jersey) USA. His age was given as 25 and he was still an instrument maker. He submitted his Declaration of Intention for US citizenship on 6 May 1924. From the form we learn that he was residing at 200 Central Avenue in Passaic, New Jersey, was unmarried, with a fair complexion, brown eyes and hair, 5ft 1in tall and weighting 188 lbs, and had no distinguishing marks. He asked for a certified copy of his Declaration and he was informed in a letter dated 2 November 1925, addressed to him at 697 Van Houten avenue, Clifton, New Jersey, that his application had been approved. The letter contained instructions and enclosed a form which he had to submit, after payment of the fee, for issuance of the copy requested. He married Elizabeth Jessie Murray Morrison on 19 June 1928 in Brooklyn, New York. They had obviously met in Glasgow where she was born on 7 June 1903 (her grandparents were Irish immigrants to Glasgow) and worked as a seamstress and where Edward was also living. Elizabeth, aged 25, arrived in New York aboard the Transylvania on 17 June 1928 (having left Glasgow on 9 June) and thus got married two days later! She was travelling with her mother Annie Morrison, aged 64 who appears to be not just going over for the wedding, but also as an immigrant. 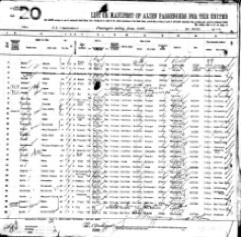 In the 1930 census for Brooklyn, Kings, New York is Edward Raitt, 28 (born abt 1902 Scotland); airplane mechanic; wife Elizabeth, 26 (born 1904 Scotland); son Edward, 12 m (born 1929 New York). They had married at ages 26 and 24. In fact, son Edward Duncan Raitt was born on 4 June 1929 in Brooklyn and daughter Annie was born 3 March 1934 also in Brooklyn. They were still in Brooklyn in 1935. 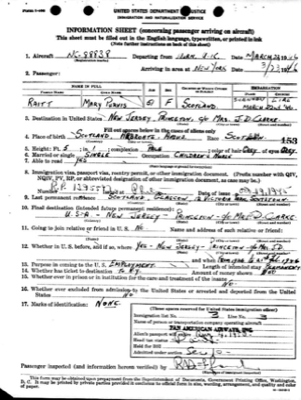 In the 1940 census for Hasbrouck Heights, Bergen, New Jersey, living at 228 Jefferson Street is Edward D. Raitt, age 38, head, married, naturalized, born Scotland, a mechanic in the airplane industry earning $2800; together with wife Elizabeth, 36, born Scotland, still an alien; and children Edward D., 10; and Annie, 6 - both born New York. Edward Raitt and family travelled from New York to Southampton arriving on 15 Dec 1947. He was a mechanic, age 46, wife Elizabeth, housewife, children Edward Jnr, 18, labourer; Ann, 13, student. The intended address was 12 Victoria Park St, Scotstoun, Glasgow. The purpose of the trip was to see Edward’s mother (and the children’s grandmother), Annie Edward Duncan Raitt, and aunts and uncles whom the children had never met. Edward’s father David had died just a couple of months after his granddaughter Annie was born. They returned to America a month later. Edward Raitt, 46, travelled from Southampton to New York on the America arriving 15 Jan 1948. He was married and naturalized in Brooklyn, NY on 13 July 1937. His address was given as 367 Carmita Ave., Rutherford, NJ. He was accompanied by his wife Elizabeth, 44, naturalized Philadelphia, 2 Sep 1942; son Edward, 18; and Brooklyn); daughter Annie, 13. David Dorward’s elder sister Mary Purvis Raitt came home to Glasgow quite a few times after her emigration to America. 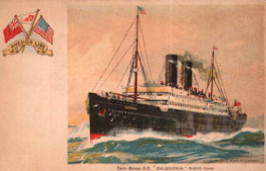 Following in her brother Edward’s footprints, she first arrived in New York on 28 May 1928 from Glasgow aboard the SS California. She was 33 and her occupation was given as typist. In 1929 she was back - she is a passenger aboard the Cameronia from New York to Glasgow arriving 8 December. Classified as a children’s nurse, aged 35, she was going to 12 Victoria Park St, Scotstoun, Glasgow. Her country of residence was given as USA and her country of future residence was listed as “foreign country”, i.e. not any of the countries in the UK but almost certainly the USA. She is recorded as travelling from Southampton to New York on board the California on 20 January 1930 - a 35 year old children’s nurse born in Arbroath. 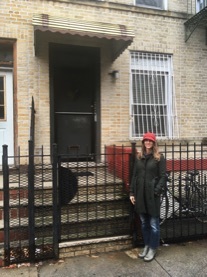 It looks as though she didn’t stay in the New York area because she appears in the 1930 census for Los Angeles District 185 where she was a nurse in the Leschin household. Her age is given as 35 and she was born in Scotland and immigrated in 1928. Interestingly the word nurse used under the Relationship to Head of Family column has been crossed out and the word servant inserted. However, her occupation further along the row is given as Prac. nurse in the Nursing industry. She came back to the family home in Glasgow again in 1931, arriving on 12 June in Glasgow aboard the Caledonia from New York. Aged 37, her occupation is given as governess. She is next recorded on 28 March 1933 arriving in New York from Liverpool aboard the Scythia. Her age is 38 and she is described as a nursery governess. On 3 April 1934 she returned from a sidetrip to Bermuda and is recorded arriving back in New York from Hamilton aboard the Monarch of Bermuda, aged 39, occupation nurse, born Arbroath. We find her again coming home to Victoria Park St in 1935 - aged 41 and a children’s nurse, she travelled from New York to Glasgow, arriving on 28 October 1835. She went back on 7 January 1936 arriving in New York from Southampton on the Acquitania. 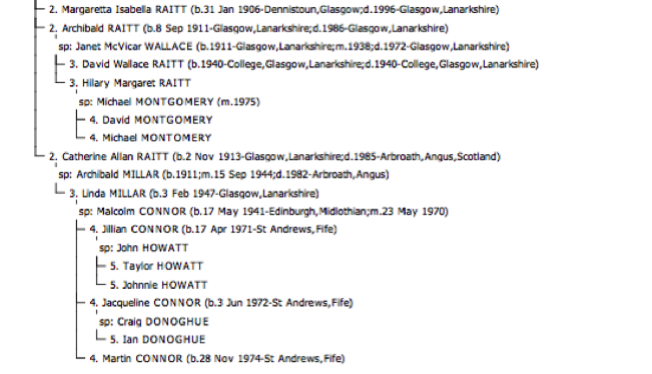 The nearest relative in the country from whence alien came is listed as her mother Mrs A. Raitt, 12 Victoria Park St, Glasgow, Sweden (sic!). Her destination is given as Farhills, Nassau (Nassau crossed through). The fare was paid by herself and she had been in the USA since 1928 - living at Farhills and the date of her lat trip was 19 October 1935. She was going to join Mrs P. W. Smith, employer, in Farhills, New Jersey. In addition to her other physical attributes (5ft 1 tall, fair complexion, white hair and hazel eyes, we learn she has a mole on the right side of her neck. In 1938 she arrived on 7 April in Glasgow from New York aboard the Caledonia as a 43 year old child’s nurse. She went back to New York on the same ship on 15 May. She is to be found in the 1940 census for Bedminster, Somerset County, New Jersey, in the Smith household (where she was in 1935), aged 44, the relationship as nurse allowed this time, though her occupation was governess in a private home. The census notes she had the first papers for citizenship. She presumably did not return home to Glasgow during the war years, but must have done so as soon as the conflict ended. She arrived again in New York on 23 March 1946 on an overnight Pan American Airways flight (101) from Shannon, Eire, which had originated in Hurn, England. (It was only in January 1946 that Pan Am scheduled five DC-4 flights a week between New York (LaGuardia) and London (Hurn). Flight time was was 17 hours 40 minutes including stops.) Her occupation was given as children's nurse and she was going to another family (Mrs J. D. Clarke) in Princeton, New Jersey. Her immigration form notes that she initially came to the US for employment in 1926 and was a permanent resident. She was aged 51, single, 5ft 1in tall, was of pale complexion, and had grey hair and grey eyes. She made the trip home again only a year or so later, travelling this time from New York to Southampton aboard the America arriving on 15 Dec 1947, aged 53 and occupation nurse - still going to 12 Victoria Park St, Scotstoun. She went back to the States on 15 January 1948 from Southampton to New York - occupation was children’s nurse. In 1956, Mary again comes home - this time arriving in Liverpool on 3 March 1956 on the Saxonia. Although she is classified as single, aged 61, her occupation is given as housewife. But she flew back - arriving in New York on 25 May 1956 from Prestwick on another Pan American World Airways flight (73/25) - one of six passengers embarking. The flight seems to have originated in Vienna, calling at Frankfurt, and Brussels and Gander after Prestwick. It must have been pretty thrilling to take long distance flights in those early days - Mary was quite the pioneer! Mary never married and appears to have died in Glasgow in 1975 aged 80. It is not known whether she was just on a visit or whether she had returned to the UK permanently some time after retiring. 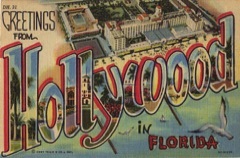 Perhaps if was when her brother Edward and family moved to Florida, for she must surely have been in regular contact with them, living as she did at least in the same state if not nearby. Funnily enough there was another David Raitt from Forfar, born about the same time, who was a manager, with a wife Halina, some twenty years younger, who appears to also have lived in Northern Rhodesia and who also made several trips back and forth between Cape Town and Southampton in the same time-frame. This may, very well - probably almost certainly, - in fact be David Dorward Raitt who may have remarried after divorcing Nora. For instance, David Raitt, aged 48, manager, and his wife Halina, 27, housewife, living in Northern Rhodesia, are recorded as arriving in Southampton on 23 Apr 1949 from Durban, South Africa aboard the Warwick Castle. Their address in the UK was given as 65 Whitchurch Rd, Islington. Why London, as opposed to Scotland (when one immigration record shows he was from Forfar) is not known - maybe that was where the headquarters of his company was located, or perhaps that’s where Halina came from. What is intriguing about this couple, is that David Dorward’s niece, Linda, remembers his wife’s name as Helena and that she lost twins and the couple never had further children. In fact Halina Raitt's maiden name was Eggert and she was born on 23 June 1923 - where is not yet known. She died on 14 April 1992 in Johannesburg. Her last address was 802 Tygerberg, Primrose Terrace, Berea, Johannesburg. It is likely that David Dorward Raitt also died in South Africa since there seems to be no record of his death in Scotland nor in Rhodesai (Zimbabwe), but how long before Halina and where is not known. However, there appears to be no death record in South Africa for David Dorward either, and unlike other South African death records, Halina’s does not give her spouse’s name, identity number, and date of marriage. This implies to me that David Dorward had probably died and was buried, quite some time before, possibly in Rhodesia and it was only after his death that she moved to Johannesburg. Since there also appears to be no birth or marriage record for Halina in South Africa, then my assumption is that she was probably Rhodesian and got married there. Some of David and Annie Raitt’s children (particularly Mary Purvis, David Dorward and Edward Duncan) seemed to have travelled widely and went to live abroad. Whether those that went to America were in contact with, and thus influenced by, the families of their two great uncles (John Raitt and James Dorward Raitt) who had gone before is not known. However, it must surely be the case that the new Americans were in correspondence with their relatives back in Scotland from time to time. David and Annie's eldest son, David Dorward Raitt, was born in Arbroath in 1897. Durward is the name on his birth certificate, but on his marriage certificate and in travel documents his name is spelled Dorward - and this I suspect is correct - having been named after is grandfather. David Dorward Raitt was a Private during the 1st World War, serving in the 16th Highland Light Infantry, 2nd Highland Light Infantry, the Labour Corps, and finally the 10th King’s Own Scottish Borderers. He was awarded the British War Medal and the Victory Medal. He arrived in France on 23 November 1915, aged just 18, and was demobbed on 2 April 1919. He appears to have gone to South Africa in his early twenties. He is recorded as travelling second class from Southampton to Cape Town on 7 May 1921 aboard the Norman. He was 23 and a clerk. His last permanent residence was Scotland (at 6 Chatham Place, Glasgow) and South Africa was given as his intended country of future residence. He arrived back in London on 10 July 1926 from Brisbane, Australia aboard the Garth Castle. His age was 28, his occupation was given as clerk and his country of residence was given as South Africa. He left the UK again on 19 November 1926 - travelling from Southampton to Cape Town on the Walmer Castle. His occupation was given as agent and his last country of residence was given as Scotland, as was his future country of permanent residence. His last address in the UK was 20 Holywell Ave, Monkeaton. In July 1929, as a 32 year old commercial agent, he was living in Northern Rhodesia and embarked on the Glengorm Castle at Lourenco Marques, Mozambique bound for London via Cape Town. He arrived on 16 November 1929 and his proposed address in the UK was 6, Chatham Place, Glasgow. 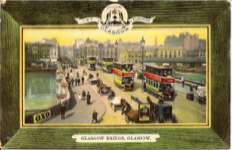 He was returning home to Glasgow to get married, on 8 March 1930, to Nora Louisa Nichol from Edinburgh. They were married in Portobello, Edinburgh and David’s place of residence was given as Northern Rhodesia, Central Africa - where they met is not known. The newly weds left Southampton for Cape Town on 4 April 1930 aboard the Carnavon Castle. David’s occupation was given as agent. Their last address was 12 Victoria Park St, Glasgow and their intended country of residence was South Africa. Nora is recorded as arriving back in the UK (Southampton) from Cape Town on 2 June 1931 on board the Saxon. Her intended address was the family home in Edinburgh. A few months later (as Mrs N. L. Raitt), aged 30, she travelled back to Cape Town in October 1931 in third class - interestingly her country of last permanent residence was checked as Other parts of the British Empire, implying that she was already living in South Africa which was the intended place of permanent residence. Nora, aged 32, returned to London on 5 February 1934 on board the Llandovery Castle from East Africa. Her address in the UK was given as 41 Claygate Road, W 13 and her country of last residence was Rhodesia. David made a similar trip from Cape Town to Southampton on 28 May 1934 on the Winchester Castle. A commercial agent from N Rhodesia, aged 36, his intended address was 12 Victoria Park St, Glasgow. Nora, age 33, a housewife residing in Northern Rhodesia, again arrived back in Southampton (en route to her home in Edinburgh) from Durban in 10 June 1935 also aboard the Winchester Castle. Her address in the UK was given as 10 Piershill Place, Edinburgh. The purpose of this trip was probably to have her baby - preferring to have him born in Edinburgh where medical conditions would have been better than in Northern Rhodesia. Ironically, baby David born on 3 October 1935 died two days later of cerebral congestion and pneumonia in the Royal Maternity Hospital in Edinburgh. Nora’s place of residence was given as Northern Rhodesia. It looks as though Nora may have elected to stay in Edinburgh after the death of her son as there seem to be no further records of her either leaving or entering the UK. She died in Leith, Edinburgh in 1978 aged 77. In August 1945 David embarked at Sydney for London on an unspecified ship. His age was given as 44 and his occupation was business manager. His intended address was 12 Victoria Park St, Glasgow and his last and future country of permanent residence was Northern Rhodesia. Then in June 1959, he again travelled from Cape Town to Southampton on the Athlone Castle. His age was given as 58, he was married, his occupation was given as accountant, his country of residence was South Africa and he was planning to stay for six months. He made the return trip on 5 November 1959 from Southampton to Cape Town. He was married, an accountant and his date of birth was given as 19 October 1900. His last address was 12 Victoria Park St, Scotstoun, Glasgow and his country of residence (last and future) was given as South Africa. He appears to be a South African citizen. The final residence for the family was in Florida – far away from the cold and rain of Scotland they had left half a century previously. Edward died in Fort Lauderdale in November 1964 and his widow, Elizabeth, died there on 22 April 1994. Son Edward Duncan died in Hollywood, Florida on 2 February 1998. His wife, Carole Gregory, born on 20 June 1931 in Passaic, New Jersey, whom he married about 1950, died in Fort Lauderdale, Florida on 27 November 2017. Edward Duncan Raitt and Carole Gregory had three daughters: Laura Roxane born 2 November 1951 in Passaic; Elizabeth (Betty) Ann, born 4 September 1955 in Hollywood, Florida and died 22 December 2018 in Suwanee, Georgia; and Carole Joy, born 1 May 1973 in Hollywood, Florida. Daughter Laura married Craig Smith in 1969 and had two daughters; daughter Betty married David Veile in 1973 in Broward, Florida and had a boy and a girl, and then subsequently had another boy and a girl with her new husband Howard Smith whom she married in 1981 in Broward; daughter Carole married James Hargis in 1996 in South Carolina and had three sons. Edward and Elizabeth's daughter Annie married Irving Cole on 8 September 1956 in New Jersey and the couple had three daughters: Linda Ann, born 23 September 1958 in Hackensack, New Jersey; Cathy Lynn, born 1 October 1960 in Hackensack; and Susanne, born 29 August 1964 in Hackensack. Daughter Cathy married Scott Schick and had two daughters; while Susanne married Chris Navarro in 1990. It seems that there was another Raitt family living in Passiac, New Jersey at the time when Edward Duncan and Elizabeth Raitt were there - Samuel Bowden Raitt, also from Arbroath, and also an instrument maker! Surely Edward and Samuel knew each other – I have tracked down Samuel’s family and have written them up on the New Jersey Raitts page. Samuel’s ancestors are included on the Raitts of Conon and Colliston page and I am trying to find out whether this family might have been related to mine!